Finally, Tata motor’s one lakh rupee car “Nano” is launched in Pragati Madan today at around 11:30 AM. Ratan Tata chairmen of Tata Groups himself drove this car to the presentation site. From the times of Tata’s announcement of making a car with price tag of one Lakh, this car has become a matter of debate. Large numbers of peoples were waiting this day with lot of eagerness when Tata will launch its small car. “Nano” is believed to be a new revolution in Indian car market and many experts believe that this car also has lot of potential for world market too. Below are the main features of Nano. 1) Tata’s Nano will have 624 cc Petrol Engine and it will give 33 bhp power (engine is in rare). 2) This car will give fuel average of 23.6 Km/L. 3) Top speed of Nano will be 105 Km/hour. 4) Petrol tank of this car will have capacity of 15 litres. 5) Nano will be available in three colours red, yellow and silver. 6) This car can accommodate 4-5 people. 7) Price to the distributor of Nano in Delhi will be Rs 1 Lakh and its actual price will be slightly more than 1 lakh for customers. 8) Nano will meet Bharat 3 and Euro 4 emission standards. 9) This car will have 21% more interior space than Maruti 800 and it will be 8% small than Maruti 800. 10) Tata will launch one basic and two deluxe models (with AC) of this car. 11) Team of 500 people have completed this dream of Tata. 12) Length of car is 3.1 meter and its width is 1.5 meter. 13) It will cost Rs 1.12 Lakh to 1.74 Lakh after all formalities. 14) Its price in US dollar is around $ 2000 and Euro 1750. 2) Tata Nano will be available in the price of Rs 1.12 Lakh to Rs 1.73 Lakh. 3) Basic model will not have AC and Power steering, whereas CX model will have AC and LX model AC, power steering and power windows. 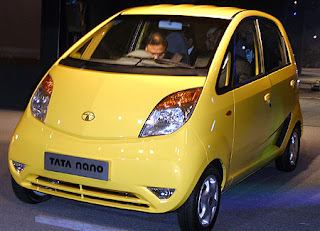 5) Tata has announced today that Tata Nano will also be available for online booking through Tatanao.com. People can find this option of online booking soon. 6) People will also be able to download form for buying Tata Nano through the Tatanano.com. 7) People will also be able to book this car through Nano 1300 retail centres available across 850 cities. 8) Tata Nano booking forms will also be available at selective State Bank of India branches. 9) Tata Nano forms will be available on other Tata retail stores like Tata Indicom stores etc. 10) Tata Nano form will cost Rs 300 and people will be required to pay Rs 2999 as booking fee which are addition to form cost. 11) Only 1 Lakh Tata Nano car will be available for booking in first booking phase which will run between 9 April and 25 April. 12) First one Lakh Nano buyers will get Tata Nano for Rs 1 Lakh only as committed by Tata, later Tata is likely to increase price of Tata Nano slightly due to increase in cost of basic material. 13) Delivery of Tata Nano will start in July and people for delivery will be chosen with lucky draw. 14) Tata Nano booking will be available through 30000 booking options in 1000 cities.